In the Open qualifying round robins, Gal was down 4-8 in the fifth against Xu Rui (2294), but with a series of attacks came back to win 11-9 and avoid a big upset. I’ve noticed in the past, both with myself and others, that often when a player struggles early on and has his back to the wall, but manages to overcome it and pull out a close match against a “weaker” player, he often goes to the opposite extreme – and that’s what happened! After struggling with Xu, Gal went up against Jishan Liang (2650) in the quarterfinals. Jishan, who has won several MDTTC Opens (including our last one in April) and was rated over 2700 last year, was thought by many to be a lock to make the final, most likely against top-seeded Sharon, especially after seeing Gal struggle earlier. But there’s a reason they play it out, and Gal won 3-0, 12,8,9! Meanwhile, Sharon won against Lui Xue, 7,8,5. (Lui’s a former member of the Chinese Sechuan Province Women’s team, and was Chinese National Junior Girls’ Team Champion and Women’s Team Finalist.) Alas, Bruno Ventura Dos Ani, from Brazil but now a member of the Texas Wesleyan College Table Tennis Team, hurt his neck and had to default to Lidney Castro. The big battle in the quarterfinals was powerlooping penholder Bowen Chen vs. the third Alguetti brother, 18-year-old Adar, with Chen winning in a close battle, 10,-11,9,9, or else we’d have had a 75% Alguetti semifinals. 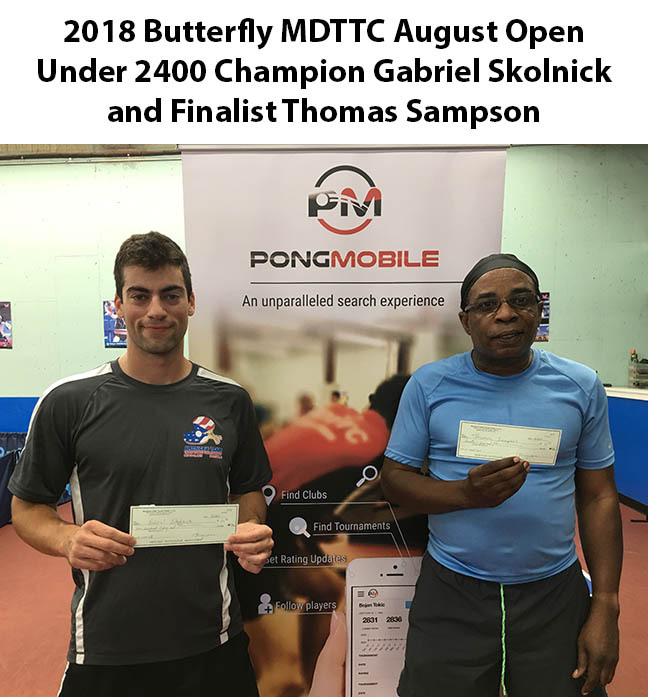 On Saturday, Gabriel Skolnick won Under 2400 over Thomas Sampson, 7,-9,5,9. Talk about wild swings – Thomas, who is rated 1979, upset Xu – yes, the 2294 player who almost beat Gal Alguetti – in the semifinals in a wild one, 9,9,-8,-8,10. In the other semis, Skolnick defeated Vikash Sahu, 9,7,8. 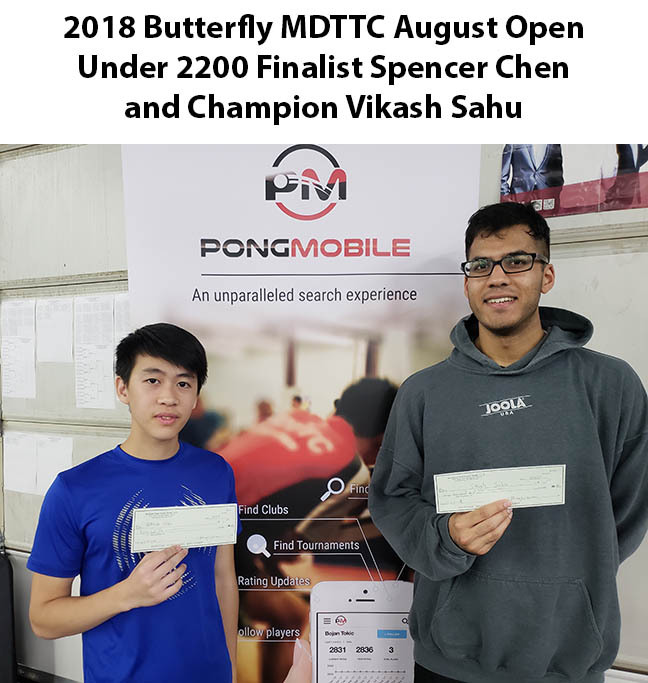 But Vikash would then win Under 2200 over Spencer Chen, 3,4,9. In the semifinals Chen came back to win against 12-year-old Connor Lee, -11,-11,8,9,7. But Connor would then win Under 2000 over Ali Paryavi, 8,-9,9,6. 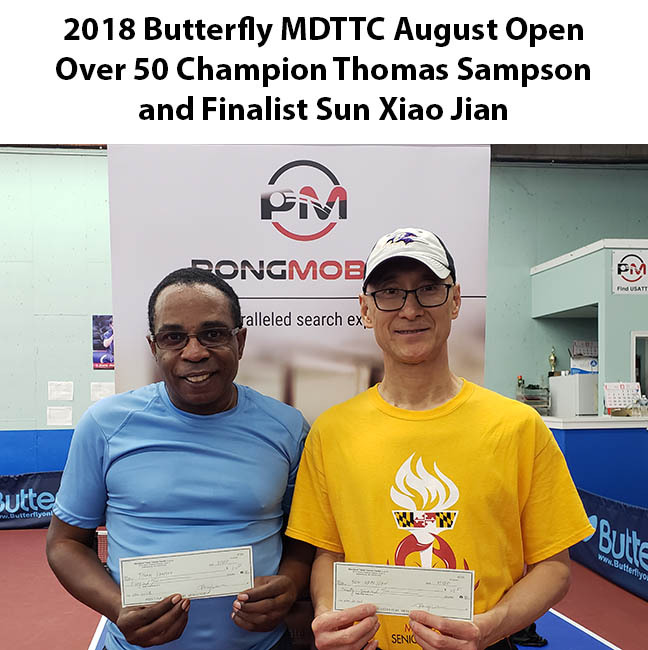 In Over 50 it was Thomas Sampson again, over Sun Xiao Jian, 8,7,8. 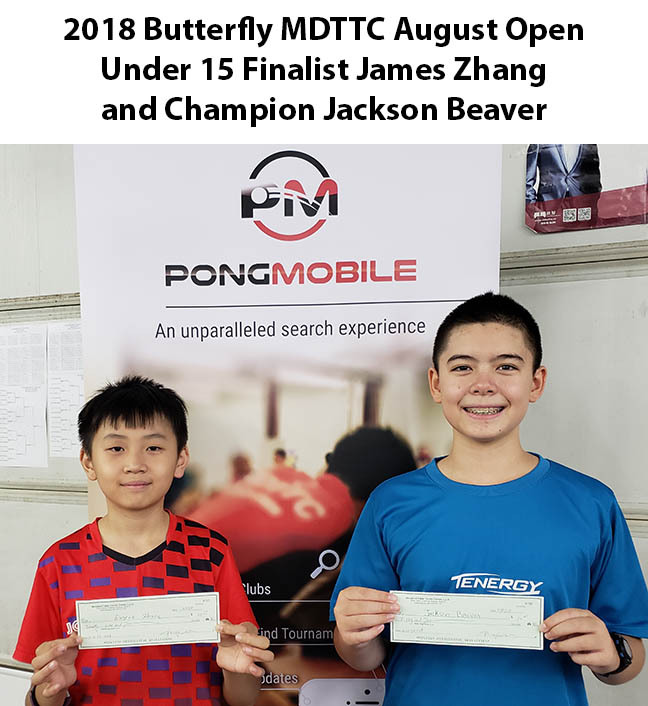 In Under 15, it was 12-year-old Jackson Beaver over 11-year-old James Zhang, 8,5,6. James would then win Under 12 over Kay O’Hara. But to avoid confusion – this was a different James Zhang than the one who made the semifinals of Under 1000 and gained the most rating points in the tournament, 242. If only the two could meet in an all-James Zhang final! 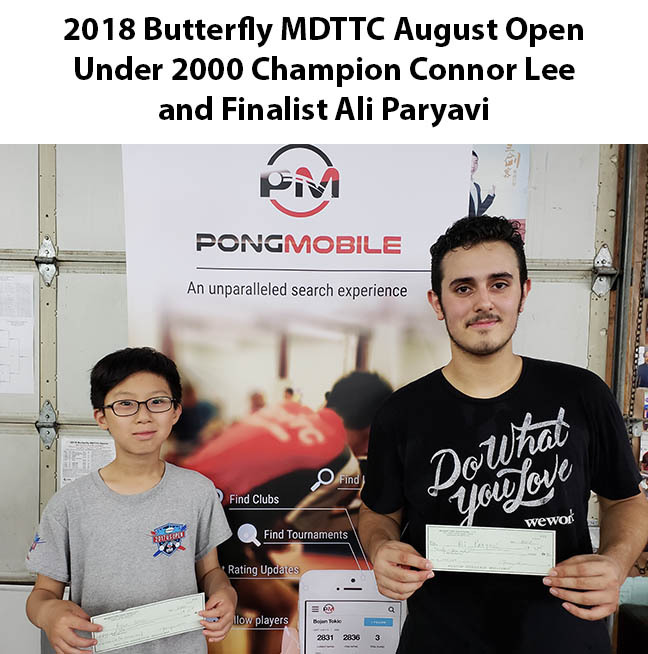 As usual, a great thanks goes to sponsors Butterfly, PongMobile, and HW Global Foundation, the latter which runs the Talent Development program that trains at MDTTC – which swept all four finalists in the junior events. 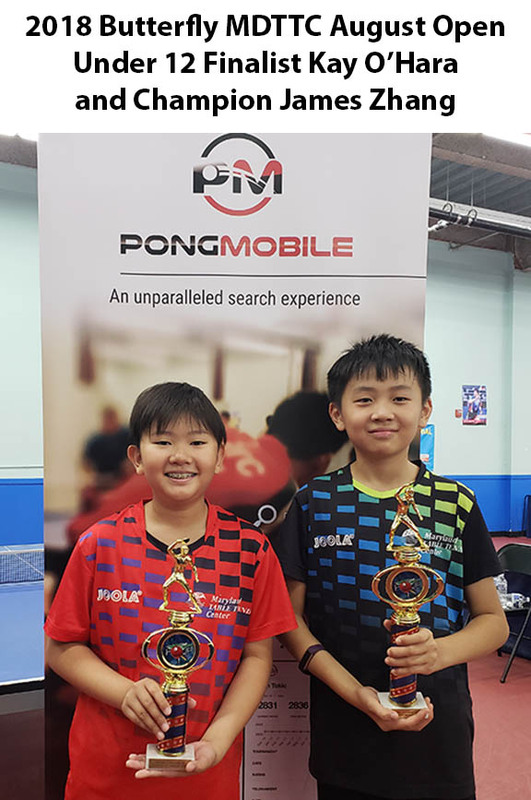 A great thanks also goes to Mossa Barandao of PongMobile, who helped run the tournament – he’s at the control desk the entire tournament doing much of the data input, plus taking pictures – see links below in results. (Mossa also sets up a station at our tournaments and leagues so players can easily look up via PongMobile, their ratings and ratings histories, both in numbers and graphic form. The station is always surrounded by players looking up all their friends, coaches, and rivals. Mossa and I argue continuously over whether PongMobile is pronounced like “automobile” – as I stubbornly do – or so it rhymes as if it were “Pong” followed by “Mobile” as he, the co-owner and founder, claims.) 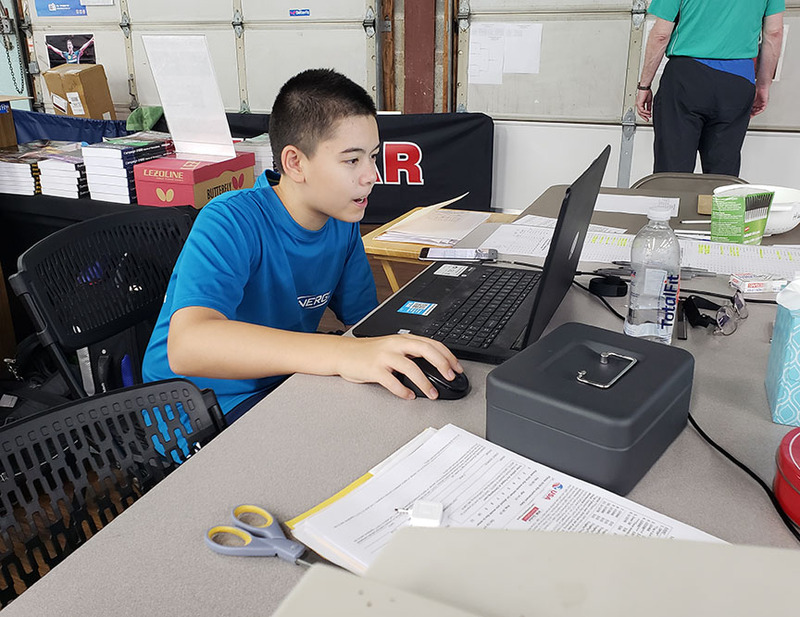 Jackson Beaver, who won Under 15 on Saturday, switched hats on Sunday and got about six hours of school SSL (Student Service Learning) as he helped run the control desk, mostly doing inputs. (He also coined the term “rating disability,” for a player who loses a lot of rating points.) And finally, a great thanks goes to referee Paul Kovac and umpire Stephen Yeh. Here are complete results, care of Omnipong. Below is a summary. 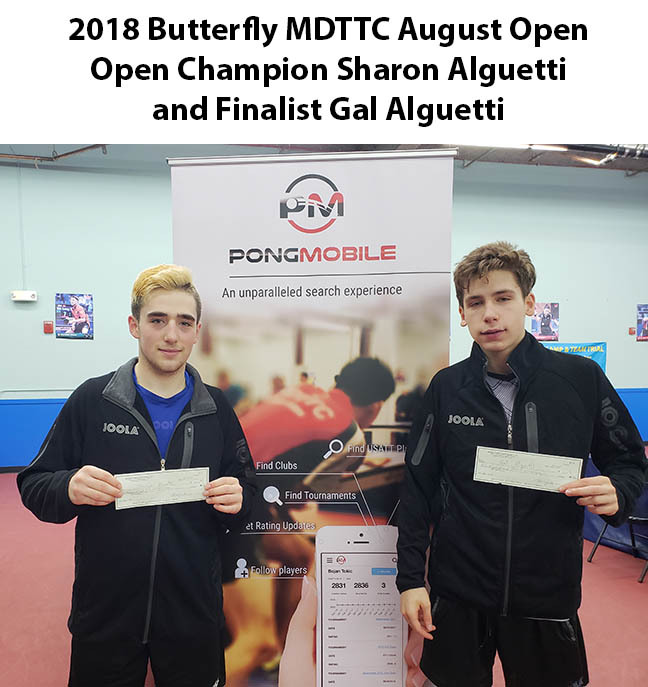 Open Singles – Final: Sharon Alguetti d. Gal Alguetti, def. ; SF: S.Alguetti d. Chen Bo Wen, 10,-10,6,10,4; G.Alguetti d. Lidney Castro, -7,9,8,-7,11,-1,7; QF: S.Alguetti d. Luo Xue, 7,8,5; Chen d. Adar Alguetti, 10,-11,9,9; Castro d. Bruno Ventura Dos Ani, def. ; G. Alguetti d. Jishan Liang, 12,8,9. U2400 – Final: Gabriel Skolnick d. Thomas Sampson, 7,-9,5,9; SF: Skolnick d. Vikash Sahu, 9,7,8; Sampson d. Xu Rui, 9,9,-8,-8,10; QF: Skolnick d. Tony Ma, 6,11,-10,11; Sahu d. Abbas Paryavi, 4,6,6; Sampson d. Louis Levene, 7,-8,5,3; Xu d. William Huang, 7,9,9. U2200 – Final: Vikash Sahu d. Spencer Chen, 3,4,9; SF: Sahu d. Mohan Yang, 6,3,6; Chen d. Connor Lee, -11,-11,8,9,7. U2000 – Final: Connor Lee d. Ali Paryavi, 8,-9,9,6; SF: Lee d. Daniel Gong, 4,6,3; Paryavi d. Jerred Miklowcidc, 10,6,-9,5. 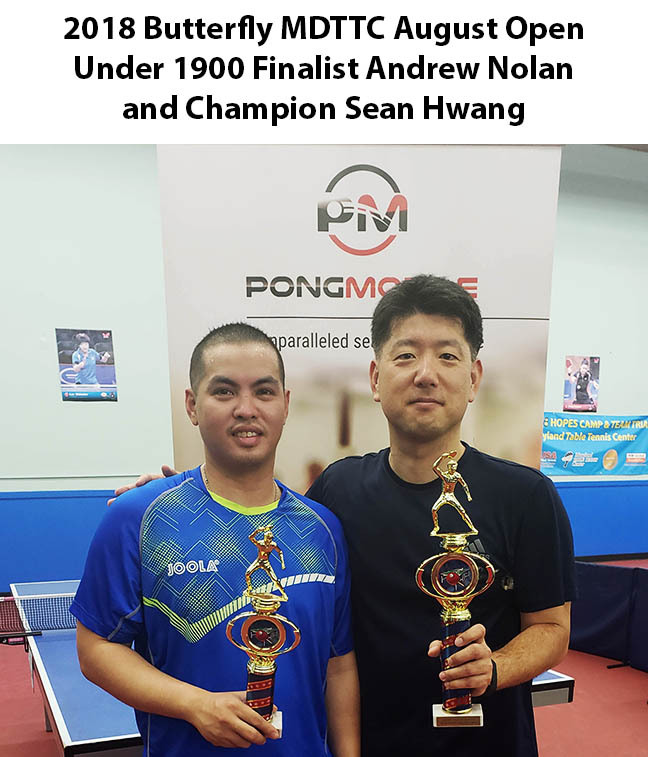 U1900 – Final: Sean Hwang d. Andrew Nolan, 6,-6,9,-8,8; SF: Hwang d. Todd Klinger, 2,6,9; Nolan d. Wang Zhantong, 8,9,9. 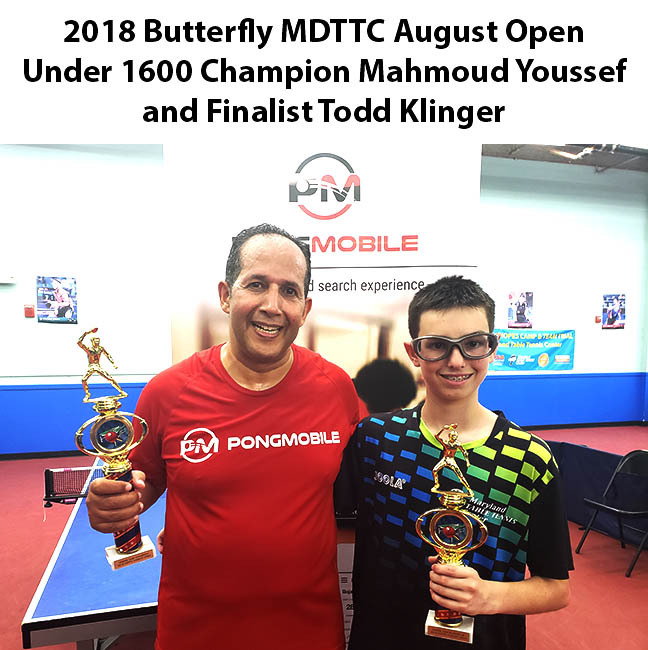 U1600 – Final: Mahmoud Youssef d. Todd Klinger, -9,8,7,8; SF: Youssef d. Andrew Nolan, -9,11,10,-12,6; Klinger d. Danny Wan, -12,6,9,10. 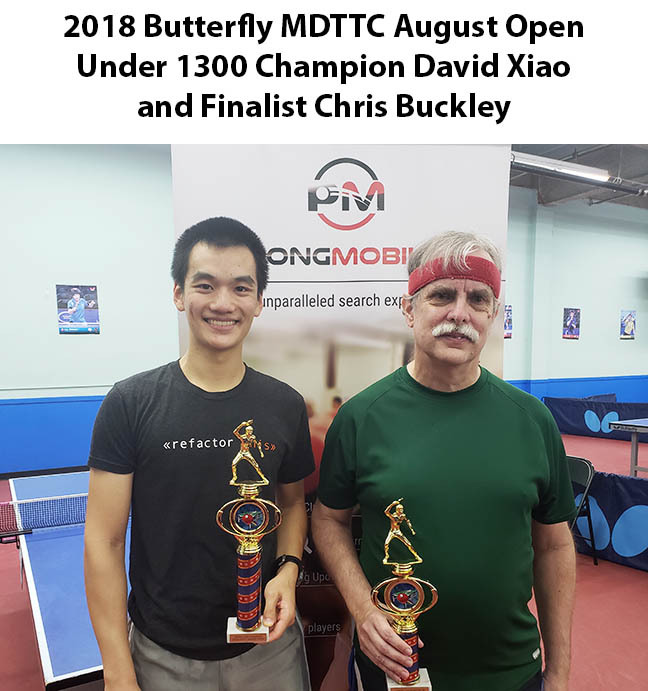 U1300 – Final: David Xiao d. Chris Buckley, 8,5,5; SF: Xiao d. Wu Di, 7,-6,9,6; Buckley d. Barry Dancis, 12,9,9. U1000 – Final: Jiang Weiguo d. Joseph Cho, 8,6,5; SF: Jiang d. Brett Hanna, 7,7,9; Cho d. James Zhang, 9,9,8. Over 50 – Final: Thomas Sampson d. Sun Xiao Jian, 8,7,8; SF: Sampson d. Lin Cheng, 5,2,4; Sun d. Mahmoud Youssef, 7,10,10. Under 15 – Final RR: 1st Jackson Beaver, 3-0; 2nd James Zhang, 2-1; 3rd Todd Klinger, 1-2; 4th Corbin Aquino, 0-3. Under 12 – Final: James Zhang d. Kay O’Hara, 4,6,9. 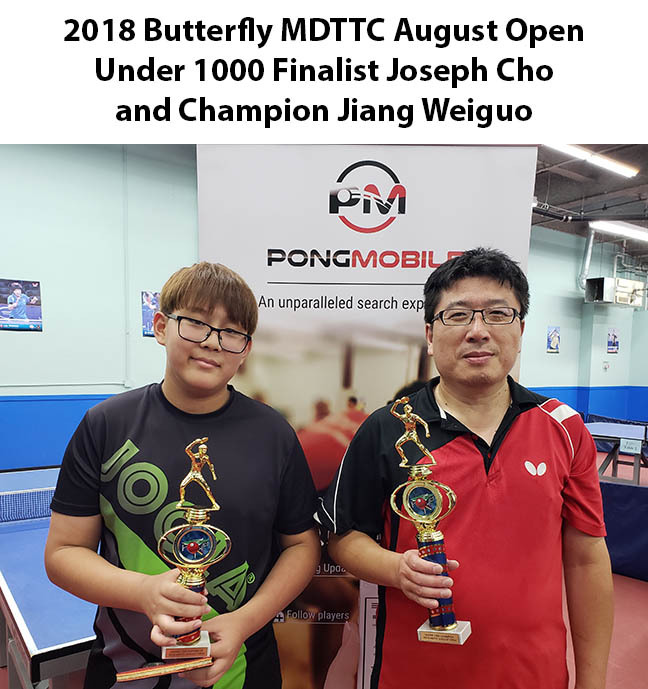 Share the post "Butterfly MDTTC August Open"